As previously advertised, Kingdom Hearts HD 2.8 Final Chapter Prologue is featured in the latest edition of Famitsu. We've secured a copy of the magazine and have uploaded the spread for you. Click to view at full size! Look at his eyes in the Screenshot. Look how sparkly they are! I need both of those Models as Renders. Thanks for posting this and sharing it with us! That Mickey render looks so fresh! And that forest looks to be the Enchanted Dominion forest as opposed to Dwarf Woodlands. Nice image. Have those official renders of Aqua and Mickey been released yet? Sigh, no. We all watched the trailer, we know how he looks in motion. Personally, I don't like it, but again, it's just what they're going for. Just curious what you see different in this screenshot, cause I am not getting it. The sparkly eyes were there before. On the other hand, his model looks pretty nice. When in my entire post did I say anything about something being different? When you said "Now that's the Mickey I love", that insinuates a difference. Especially when it is followed up by an example; you followed with his eyes. Also, it was just a question. It looks nice i guess,Mickey looks good. 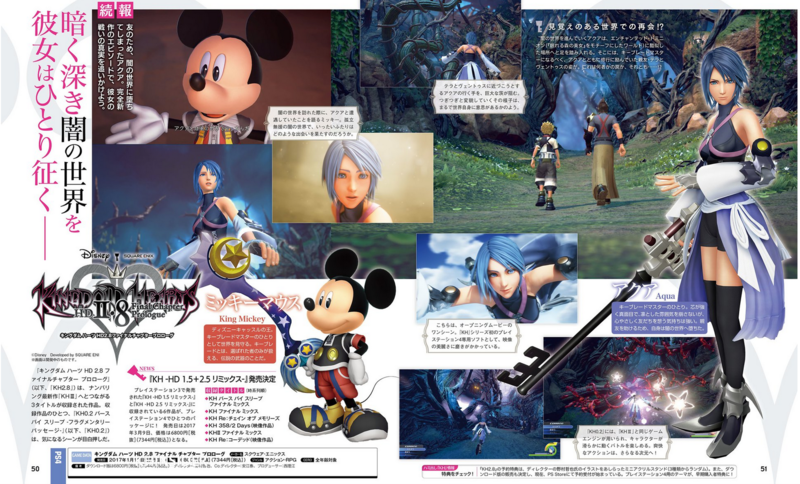 The same render of Aqua (albeit with the Keyblade cut off by other random non-relevant stuff) was included on a different page. I included the small image of it as well. Again, click to view it at full size. Mickey finally has his "Always-round" ears again! I know it was probably hard to implement in the earlier games, but it always bothered me that his ears got flat when looked at from an angle. I'm pretty curious about that screenshot with the Darkside. Will you actually be fighting them as you make your way through the forest or are they just there for atmosphere? Edit: Ok, seems he has them in other promotional art. A guy can dream though when it comes to in-game. Really starting to get the vibe is this story will pretty much be us chasing phantoms of Ven and Terra and when we finally catch up to them they will become her memories of Vanitas and Terranort and that is where Mickey will come in. Look at that Mickey render! That's how you Mickey! Why can't they Mickey properly in-game?!? !